It’s a Soup! No, No….wait….. It is not often that I concoct a recipe that is a “soup” for one event and a “cocktail” for another. In fact this is the first time ever and I must confess it gave me a little culinary thrill. It was a coup without intention..a “culinary coup” if you will. 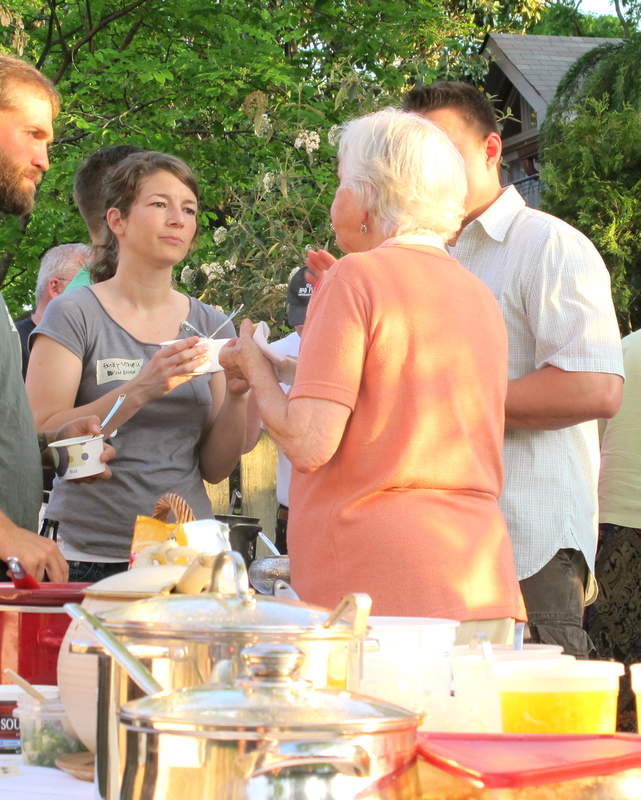 We received an invitation to a neighborhood “Soup Supper” party a few weeks ago. It is usually cold or cool when this yearly event happens. Not this year. 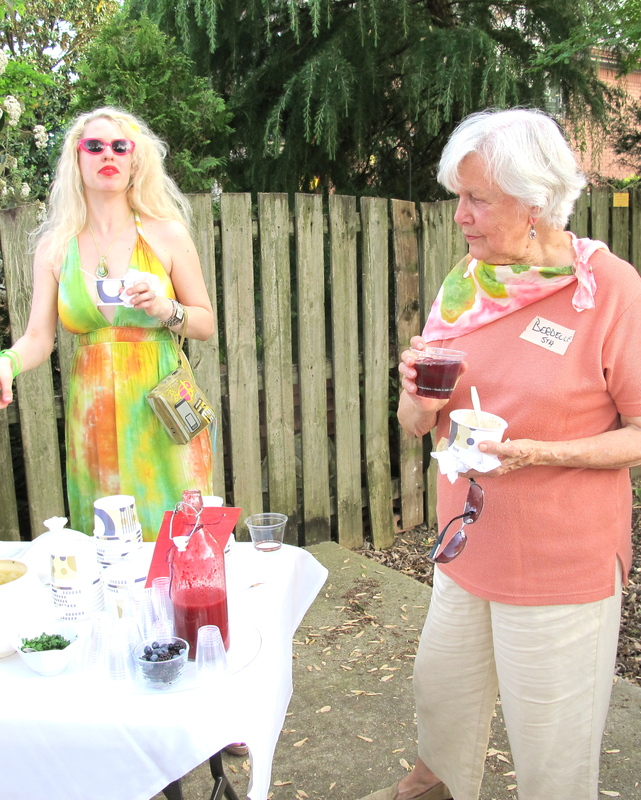 The day of the supper party (a pot luck soup supper) it was around 80 degrees here in Nashville. Not exactly hot soup weather. 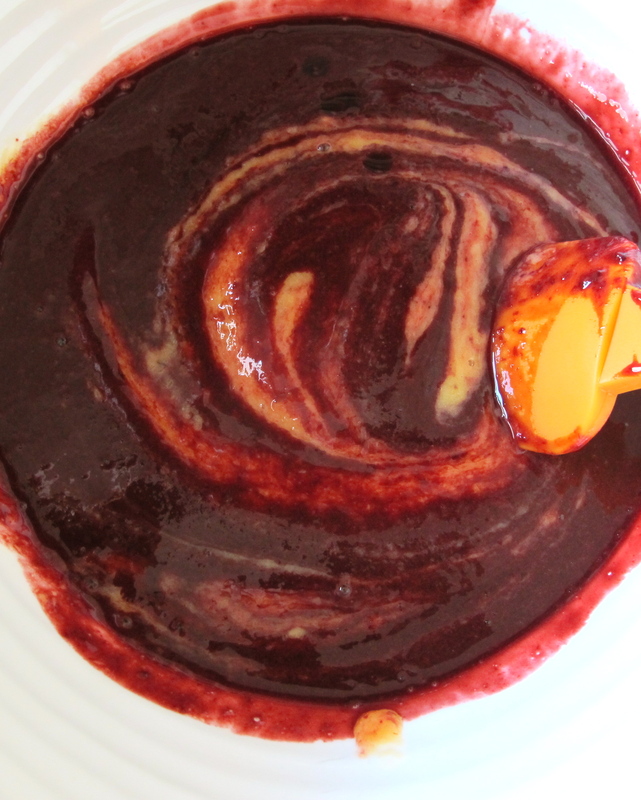 I was hot, I was thirsty, perhaps I would make a cold, thick, drinkable soup with a splash of rum…I rummaged around in the freezer and found a lovely packet of frozen blackberries from last summer that I had put away and some frozen mango chunks from a few weeks ago. A good base for a cold soup. 1. 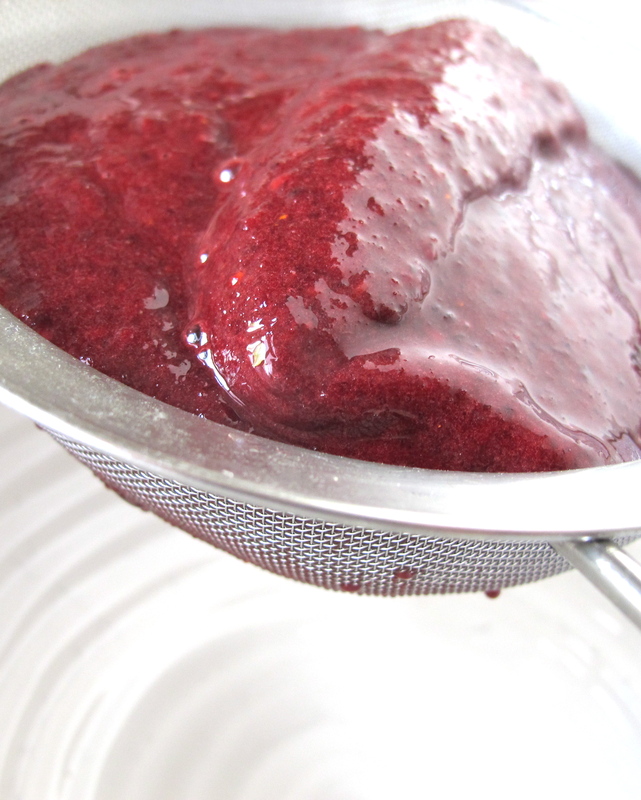 Process Blackberries in a food processor until pureed. Strain out seeds over a large bowl. 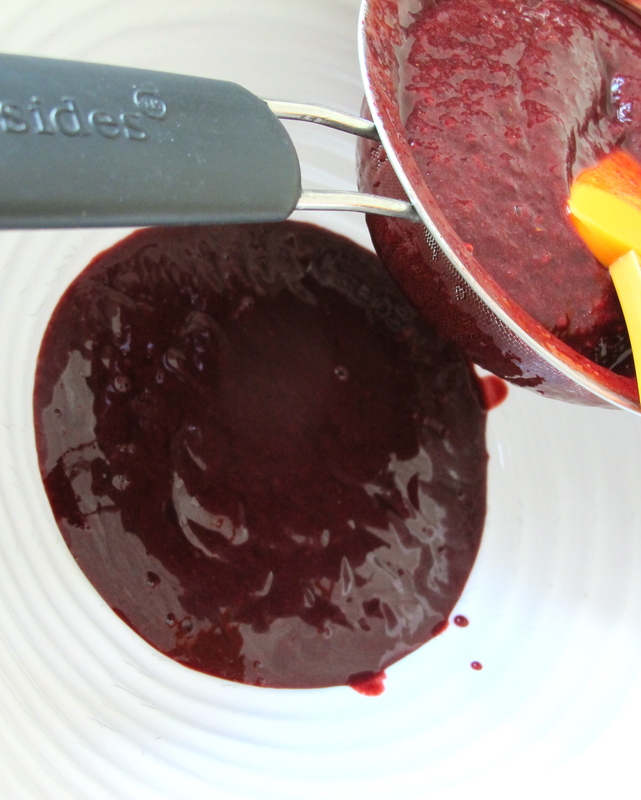 Use a rubber spatula to press and separate pulp from seeds. Discard seeds. 2. 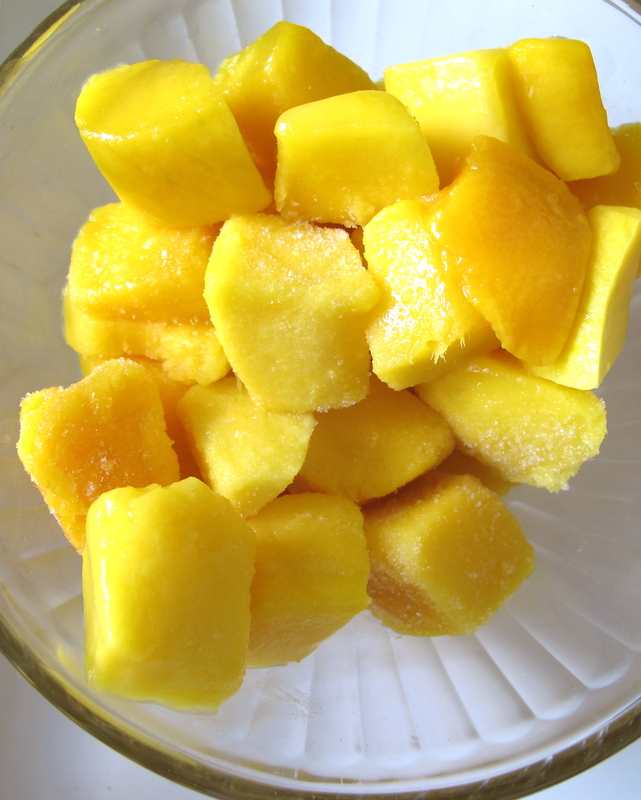 Puree Mango chunks until smooth. 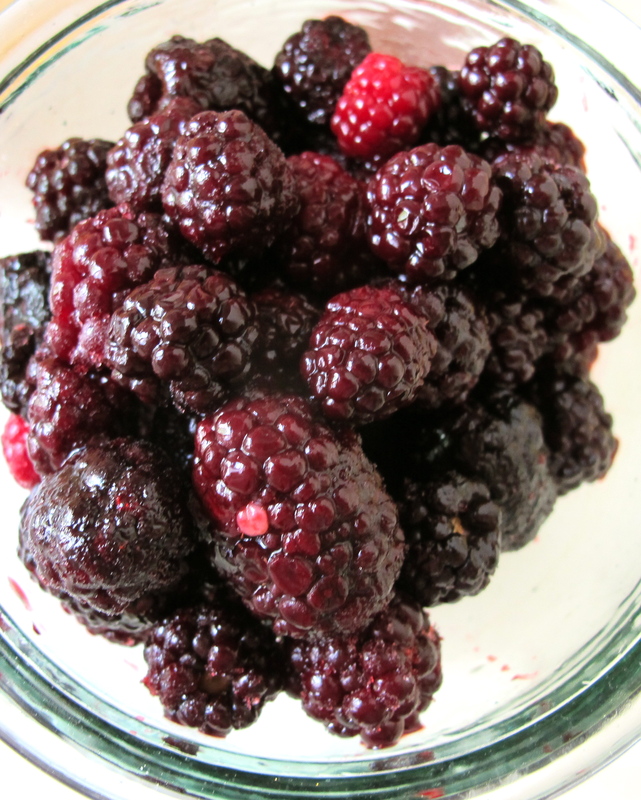 Do not strain & add to blackberries in bowl. Stir together until well mixed. 3. 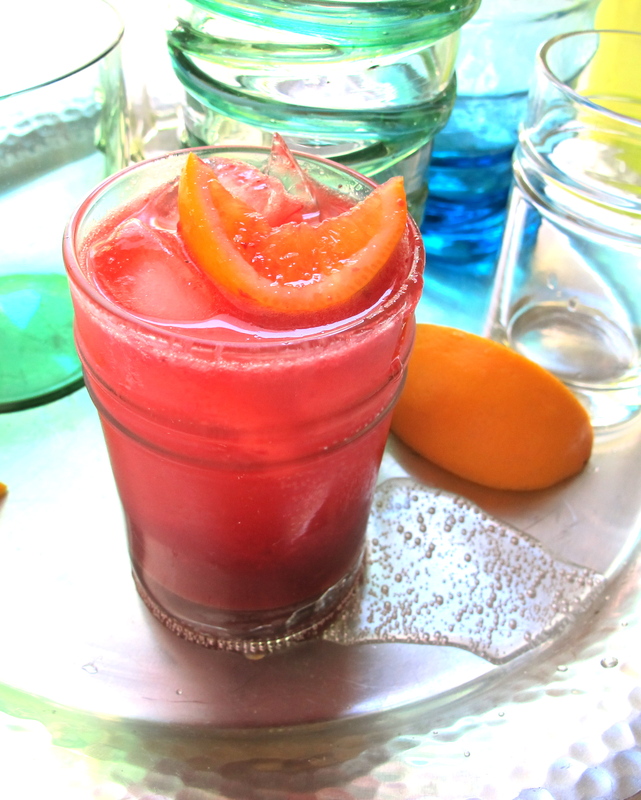 To the bowl of Blackberry-Mango puree, add Corsair Spiced Rum, Fruity Syrup, Simple Syrup, lime & orange juices. Mix together. Taste & adjust if necessary. 4. 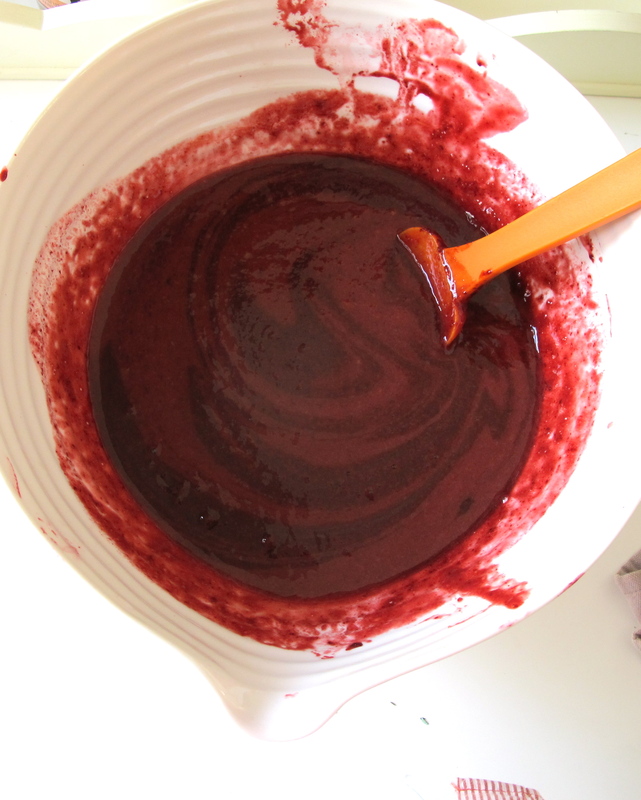 Pour half of the mixture into a glass quart jar, leaving a bit of headroom and freeze until ready to use. 5. Decant the other half into a bottle. 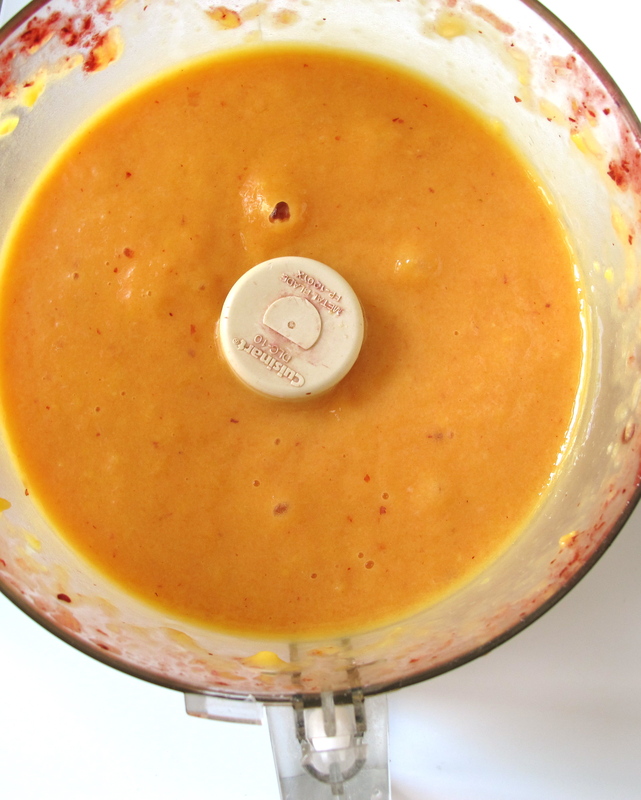 This half will be thick but drinkable…a perfect appetizer soup on a hot day. 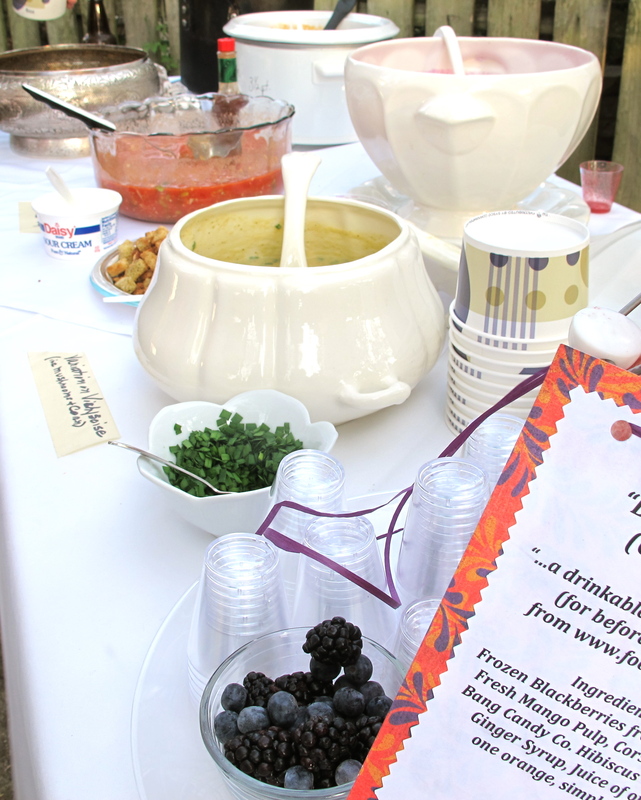 Serve cold soup with small glasses and berries to garnish. 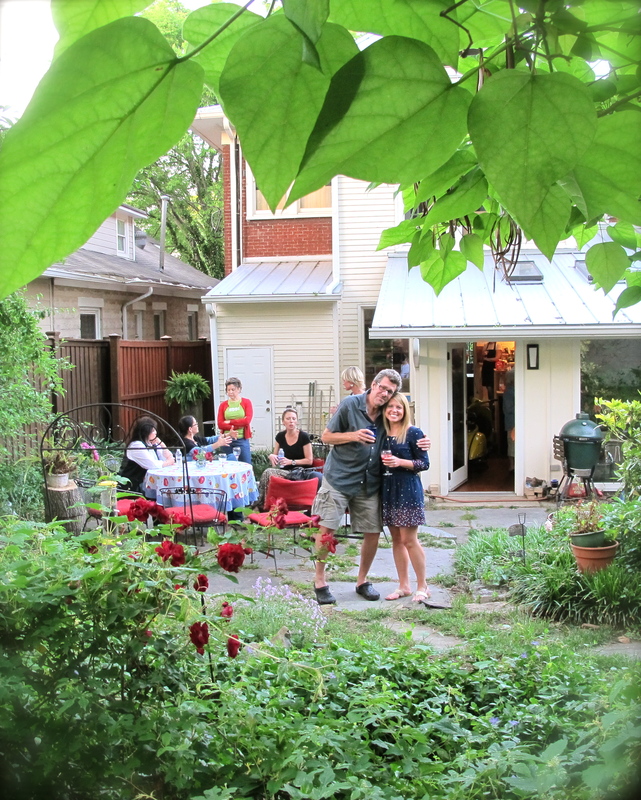 As you who follow my blog probably have already figured out, every 3rd Thursday of each month for the past 3 years two friends of mine have hosted “Third Thursday Pot Luck” dinner parties here in Nashville. 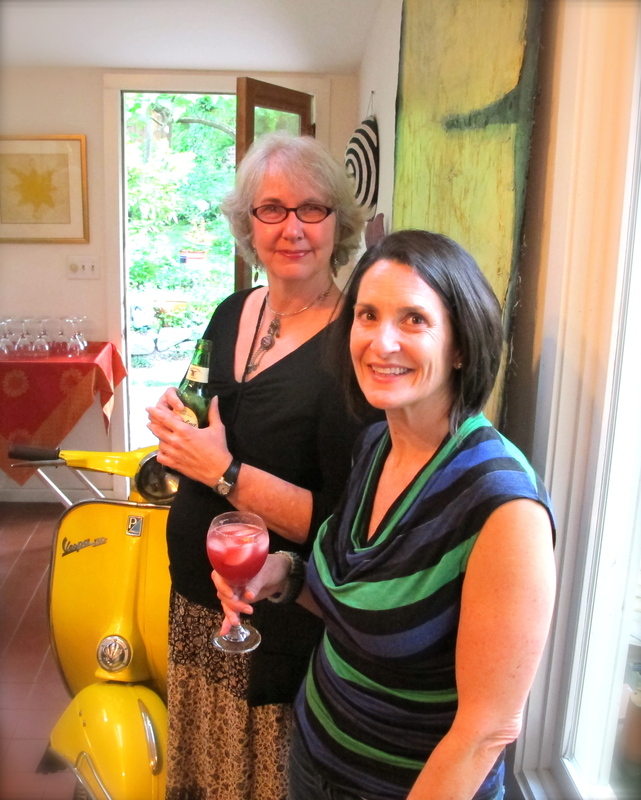 Nancy Vienneau & Gigi Gaskins have generously opened their homes for this gathering of friends to share & enjoy good food, conversation, drink and lots of laughs. 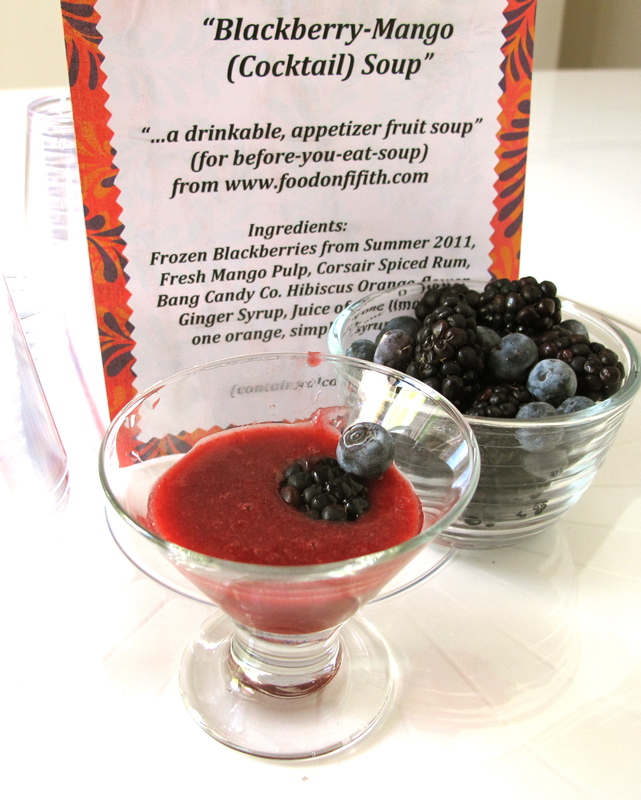 The food is alway plentiful, beautiful, seasonal so I usually make a cocktail for before dinner…time to put the frozen quart of Blackberry-Mango Soup to work! 1. To thawed puree add 1 additional cup of Corsair Spiced Rum & 1/2 cup simple syrup. Stir to combine. 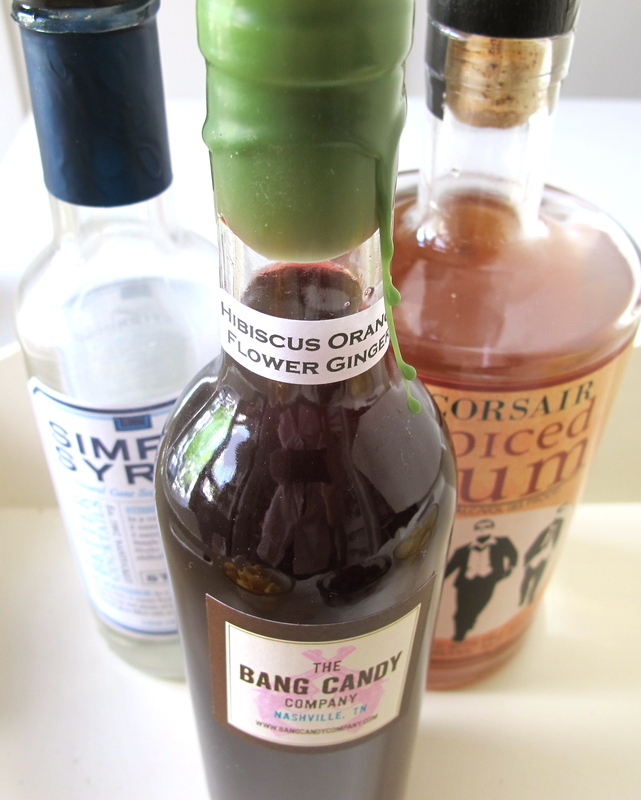 Taste & adjust flavors to suit…more rum, more syrups, more lime juice? Decant into a decorative bottle or pitcher. Chill until ready to serve. 1. Serve poured over ice filling glass half full. Top with Ginger Ale and a freshly squeezed orange or mandarin slice. 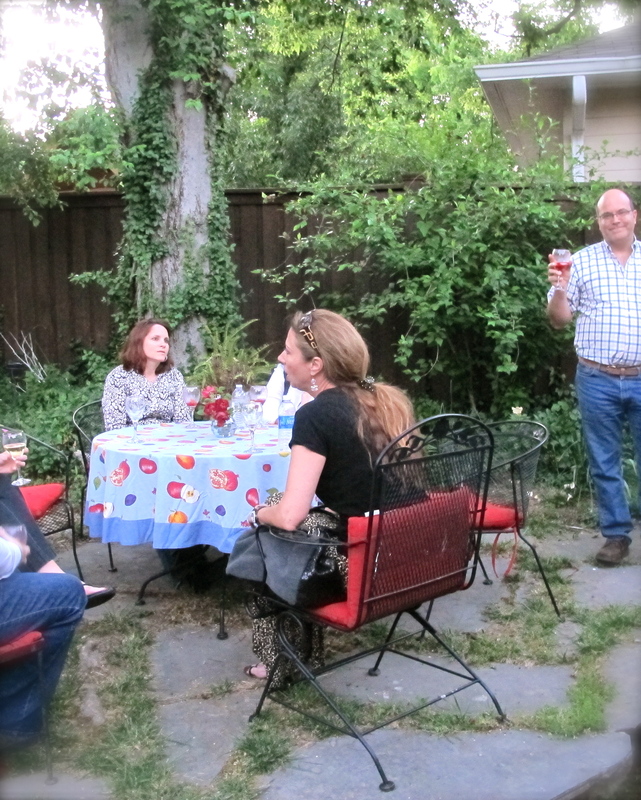 Leah, Wouter & lots of other guests enjoying the beautiful evening. Blackberry-Mango Cocktail seems to be a hit! Bill always makes the ladies laugh! 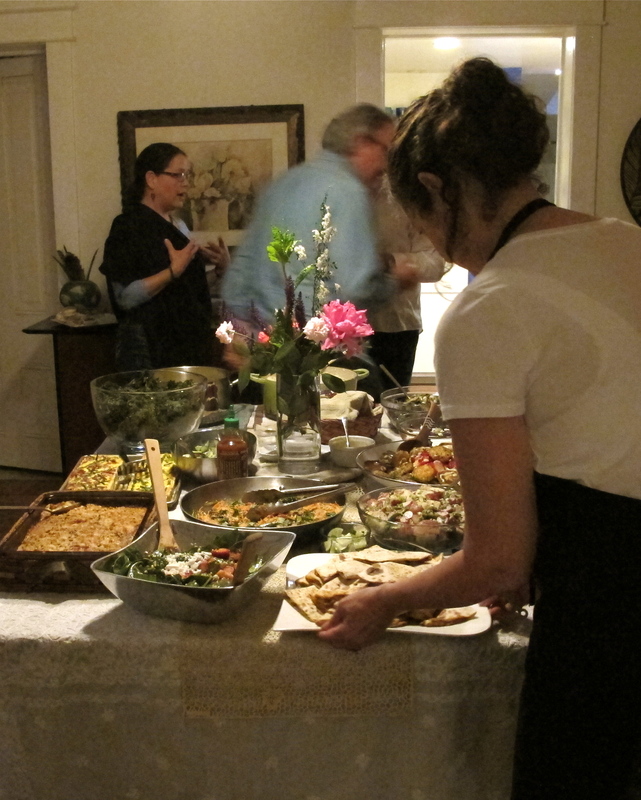 Nancy busily makes sure there is room for every dish. There are always fresh flowers. Dusk arrives as we gather around to fill our plates. 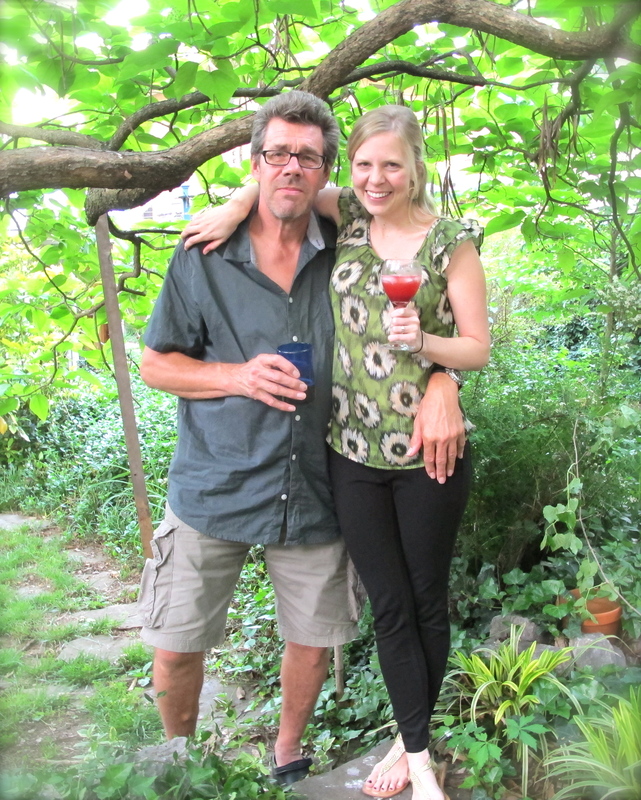 It was a “soup”, it was a “cocktail”…..both lovely libations for whatever ails you! Oh, Teresa. What a gorgeous soup/cocktail. It looks as if it was perfect for this lovely event. What great fun. You know I love blackberries. They are a pain to puree and get seeds out, so worth it. It’s brave to bring a cold fruit soup anywhere, but what a treat. Of course, I’d love that cocktail too. As always delicious and fun. Loving the cocktail, and the pictures of the mango had me drooling, I really must go and hunt some out, there’s nothing like them. 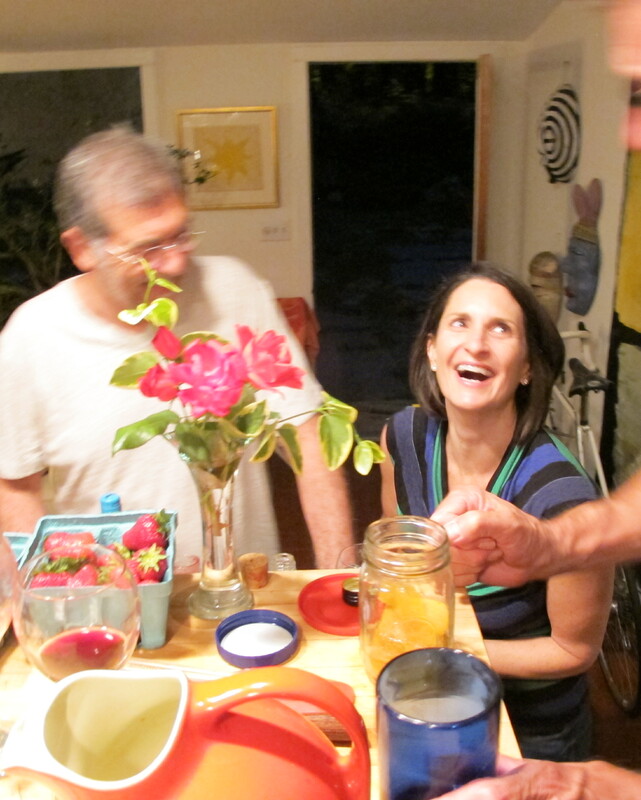 The Third Thursday Pot Luck dinners loook and sound a lot of fun, what a great idea! Call it whatever you like, I want three! Soup or cocktail, this was a beauty. A delectable, dangerous beauty, I might add! 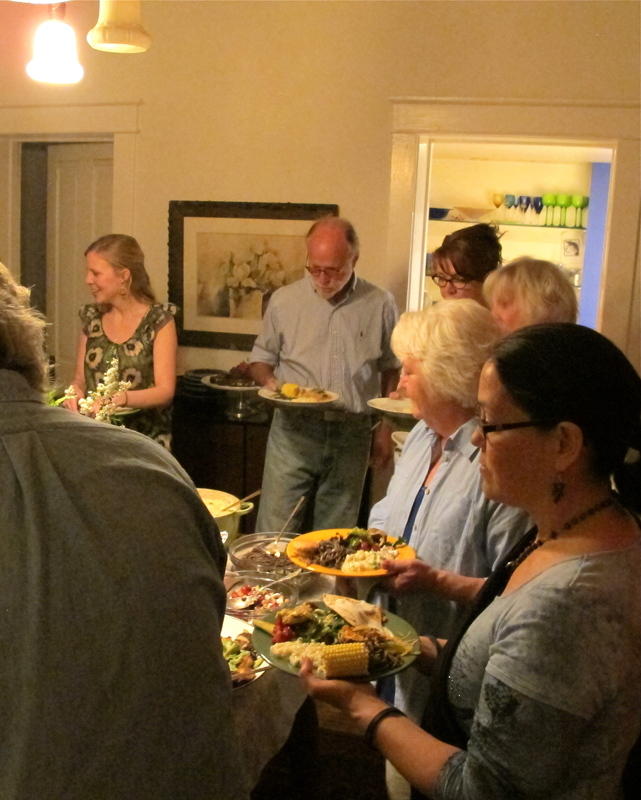 The potluck pics look so nice, T! It was a fun evening and the night was beautiful…perfect for pics. I Love your blog. It makes me produce a hungry smile! A cocktail soup? Oh ya that is right up my alley! 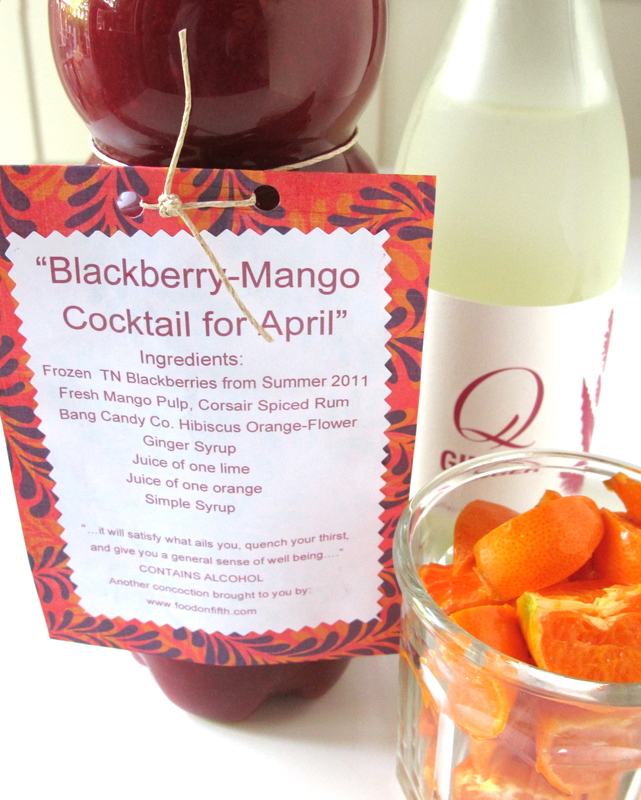 What a fantastic and refreshing drink for springtime! This looks like it would definitely go down smooth… Thanks for sharing, Teresa! What fun…love it all. Is that an Italian scooter in the room? Yes, a Vespa! Nancy and Bill have it sitting into their tv room, right off the patio…for quick get aways. I love almost everything that has mango in the ingredients list, and this tea is no exception, the blackberries pair so nice with the mango flavor!!! haha – soup is always better with rum in it. and what a gorgeous colour! You make me look forward to letting go of what I would usually make with these fruits…frozen mousse sorbetto. Here’s to making a very refreshing beverage. Thanks for the inspiration Teresa. Ciao for now and here’s wishing you more great times with good friends. Those pot lucks seem like so much fun. They are the most fun Denise and Claudia. Wish you could come to one of them. 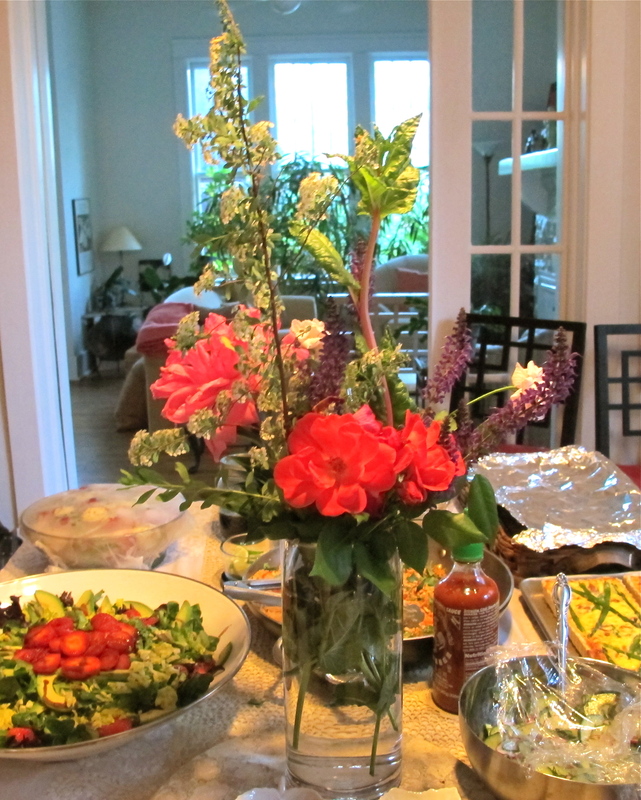 Nancy and Gigi are the best hostesses and the food is always a wonderful surprise. Fruit cocktails are always good for our body and skin. Very nice recipe.